I visited a Kushi katsu specialty restaurant when I escorted an Australian school trip to Japan about 10 years ago and had Kushi katsu freshly made in front of me. It was so delicious that I wanted to share the recipe with the Chopstick Chronicles’ readers. Just in case you are wondering what Kushi katsu is, it looks a little like cheese fondue or chocolate fondue. 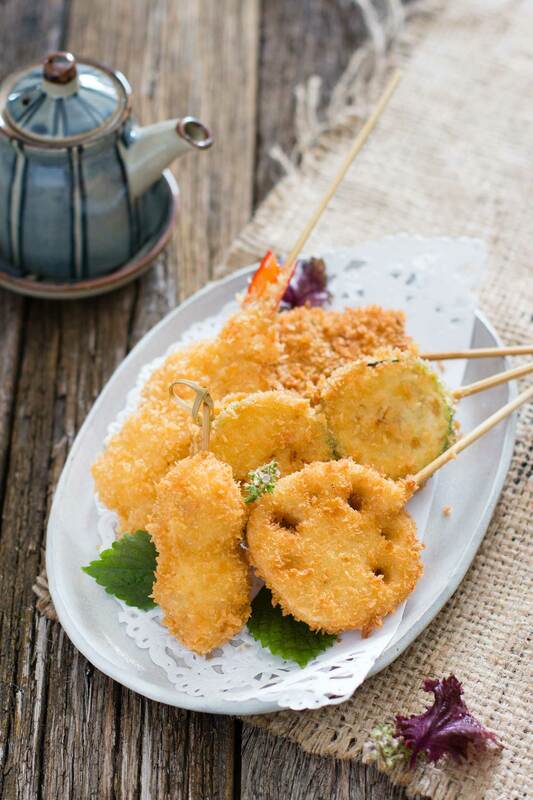 Instead of ingredients dipped in chocolate or cheese, skewered ingredients are coated with batter and panko crumbs then dipped in oil to deep fry. 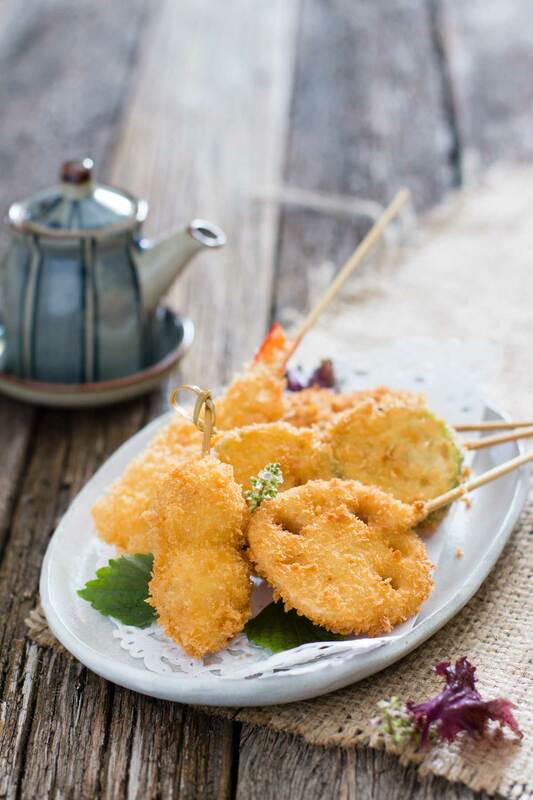 The most commonly used ingredients for Kushi katsu are seafood (such as prawn, crab meat, scallops, any fish meats fillets, and fish cakes), beef, pork, chicken, sausages, ham, cheese, and many vegetables (such as potato, sweet potato, eggplant, pumpkin, onion, mushrooms, etc). 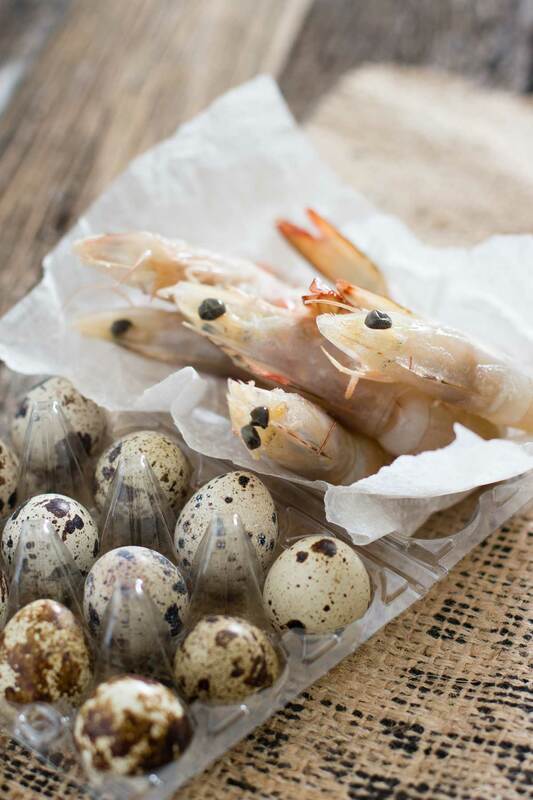 My favourite are prawn, renkon (lotus roots), shiitake mushrooms, quail eggs, purple sweet potato and pumpkin. Deep fried prawn is the same as Ebifurai, but somehow tastes different when the prawn is skewered. It is fun to eat on skewers, however. Actually, when all the ingredients are on skewers it is fun to eat, especially Renkon lotus roots, as they are quite cute and that’s why it is one of my favourites. I wanted to use Chikuwa as well but I did not get one. Chikuwa is a type of fish cake shaped like bamboo – it has hole in the middle. This is my absolute favourite of Kushi katsu with a stick of cheese. 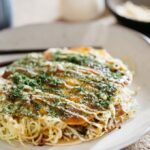 I thought it may be difficult for some of the readers, so I did not include Chikuwa and cheese in the photo, but if they are easily available in your area you should try it. When you prepare the ingredients, I recommend cutting the ingredients into bite-size pieces so it is easy to deep fry and eat. 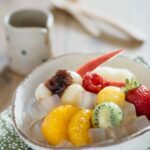 Usually, bamboo skewers are used. There was not much choice in Japan, but here in Australia there are fancier looking skewers available too – as you can see in the photos. I recommend bamboo skewers of about 15-20cm long, and thin (about 2mm in diameter) so that it is easier to spear the ingredients and easier to deep fry too. It is also wise to use flat containers to apply the batter and crumbs. There are many types of dipping sauces for Kushikatsu. 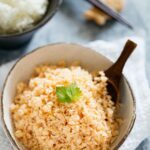 Personally, I like using just soy sauce or a little bit of salt and a squeeze of lemon, but I included special Kushikatsu sauce in the recipe as well. 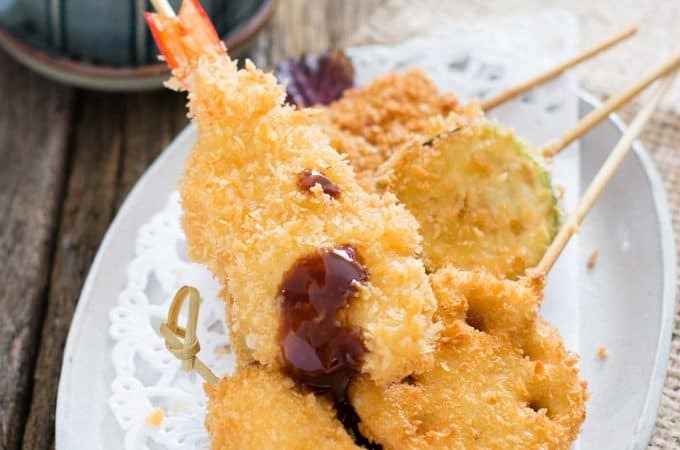 This Kushikatsu sauce recipe is Osaka style. There are many different flavours, and I recommend Miso flavours too. Hope you enjoy Kushikatsu at home! Prepare the ingredients by cutting and slicing to bite size. 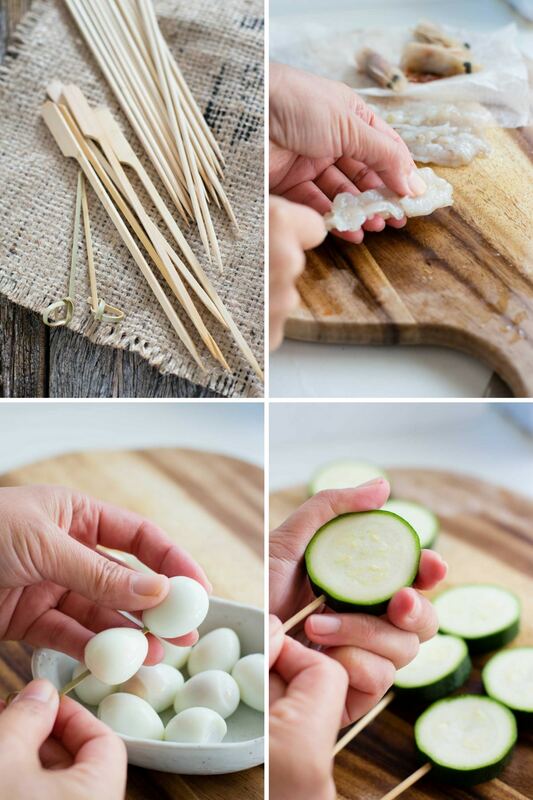 Spear the prepared ingredients with skewers and set aside. Mix the egg, flour, water and mayonnaise in a small bowl to make a batter. Coat all skewered ingredients with batter, then coat with the panko crumbs. Heat frying oil in a deep pan that is a deep enough so the skewers can be dipped in, until it reaches around 180 degrees Celsius. Deep fry each skewer until it’s crispy and golden brown. Place all sauce ingredients in a small saucepan over medium heat. Combine and stir until all ingredients dissolve. Turn the heat off just before it boils. 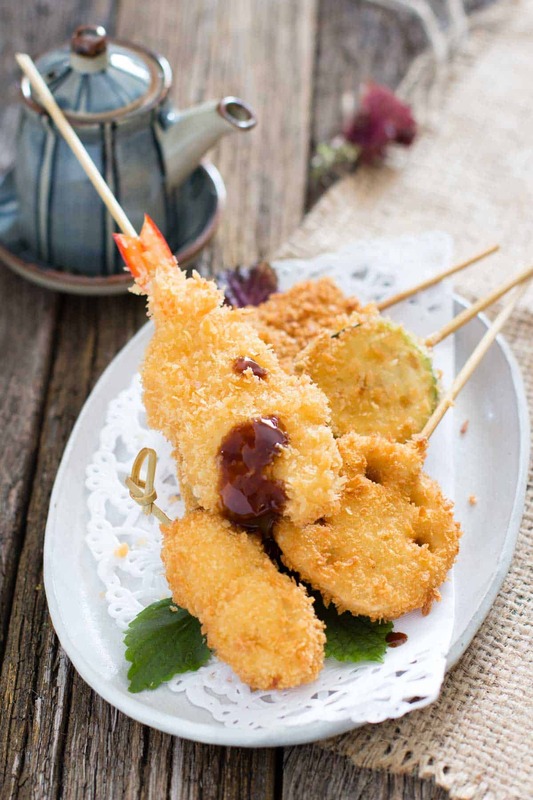 Serve Kushikatsu with the dipping sauce. This is what I have learnt from a Japanese chef. Chop off prawns' tails so that when it is deep-fried, the air escapes from the cut to prevents oil from spattering. Calories are estimate only as it is hard to accurately calculate the amount of oil used for deep fry. Japan is one of my favorite country for their various delicious and traditional foods. This one also looks yummy and testy. And I’ll surely try it soon. My wife and I just got an air fryer and we both LOVE Japanese food! We would love to try this recipe! Thank you for sharing! Hey! Thanks a lot for sharing this recipe! It was a great success! The great taste brings me with so much appreciation! It made my day 🙂 Will try this again for sure!